These days when everyone texts, tweets, and writes on your wall, it is really rare to get mail…like from the U.S. Postal Service. This card came in the mail today along with a disc of Conrado’s images from the wedding. 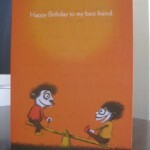 The front reads, “Happy Birthday to my best friend.” I started tearing up. Inside it continues, “I’m kidding, you’re like my 3rd best friend, but they don’t sell cards that say that.” I busted up laughing. I don’t think Conrado reads my blog so I’ll just tell you what he wrote…so sweet.